W hen it comes to rebellion in a dystopian society, there has to be giant screens with the dictator's face pontificating pablum for the proletariat masses. That is the world of "Equilibrium" and the land of Libria. After a third world war, the survivors of Librium decided that it is the unchecked emotions that humans fall prey to that are the root cause of violence and war. Taking a hint form the Stoics of Ancient Greece, the Librians have outlawed emotions declaring it Sense Crime. Unlike the Vulcans of the "Star Trek" universe who replaced emotions with logic, the people of Libria medicate themselves daily with a drug called Prozium, an emotion stabilizer that keeps the population in check. In this seemingly sterilized world of modern, tall, fascist looking buildings, armed guards stand on the sidelines in their black visor helmets constantly vigilant for any form of Sense Crime. Even the young children participate in the witch-hunt. In charge of much of this are the Grammaton Clerics, a quasi-religious - arm of the law who lead the charge against emotion. Writer and director Kurt Wimmer ("The Thomas Crown Affair") provides the audience with a social message buried in the spectacular Gun Kata fights. Christian Bales stars as a conflicted cleric who like all protagonists in any dystopian rebellion must overcome his own feelings or in this case lack of them to bring down The System. 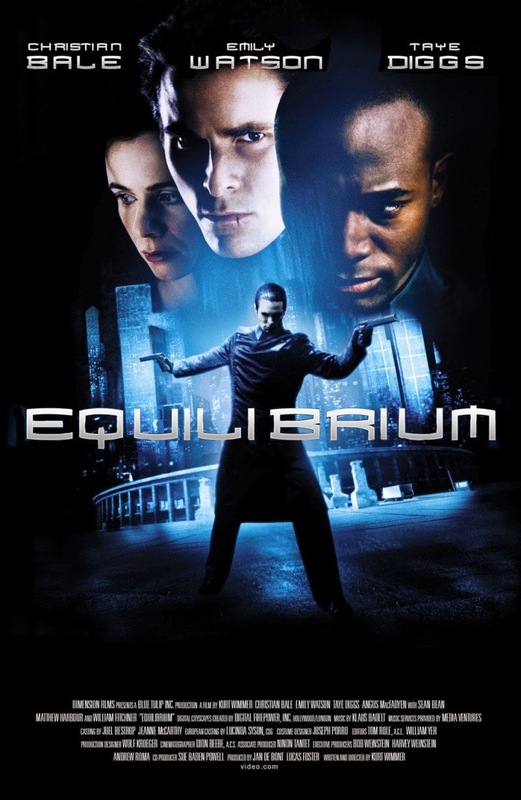 Due to the amount of violence, the MPAA rates "Equilibrium" R and the film runs about an hour and forty-seven minutes. Although "Equilibrium" is derivative in many ways, drawing from the works of Orwell, Huxley, and Bradbury, writer and director Kurt Wimmer packages the concepts of freedom of thought nicely into a film that doesn't dwell too deeply in the philosophy, but utilizes action elements that will appeal to the adrenaline or the video game junkies. Christian Bale is Cleric John Preston. 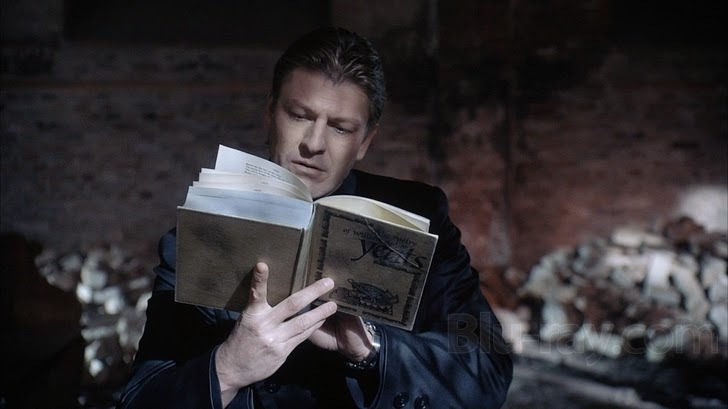 Dressed in black with a high collar, he and his partner Errol Partridge (Sean Bean - "The Lord of the Rings: The Fellowship of the Ring") enter a building outside the city in the Nether that was identified as a resistance stronghold for The Underground. Along with squads of police, some in riot gear, they come to a room where the offenders plan to make their last stand. In "Matrix" fashion, with monastic vocalizing in the background, Preston runs toward the door, knocking it down, in the dark, he begins a gunfight that seems impossible to win. The strobe like glimpses of gunfire as Preston performs a ballet in the dark with twin fully automatic Beretta 92FS. When the lights go on, all are dead except for Preston. His partner and the rest of the squad enter and after a brief inspection, Preston orders that the police hack through the floorboards. Underneath are rare classical paintings including Leonardo DaVinci's "Mona Lisa." Like the fireman in "Fahrenheit 451," Preston calmly orders all the pictures burned. Preston's career so far is stunning, his intuition of what people are thinking, and his faith in the Tetragrammaton Council seems unshakeable, until today. Returning to the city with his partner, both sitting in the backseat, Preston notices a poetry book in Partridges coat pocket. When Preston asks him about it, Partridge’s answer raises a red flag in Preston's mind. In totalitarian societies that we, as viewers, have come to know, suspicion is a virtue. The government encourages children to denounce their parents and friends to turn on friends. In a supposedly emotionless society, this betrayal is just par for the course. In Orwell's "1984," he surrounds us of images of Big Brother, but here in Libria, Father played by Sean Pertwee ("Event Horizon," "Dog Soldiers") doesn't have much of a role in this film, but his voice and his image is everywhere dictating the benefits of Prozium to a blank staring society. Similar to "1984," a poem voices the central theme of the film. Preston, led by his suspicions, finds Partridge in a crumbling cathedral the Nethers, sitting and reading William Butler Yeats' "He wishes for the cloths of heaven." Preston shoots Partridge in the head. Here, the poem instills the theme of "Equilibrium" in both Preston's mind and the viewers. Wimmer doesn't want to make a political statement, but instead the message is more spiritual or philosophical that strikes out against unity and conformity. After Preston accidentally loses, one of his doses of Prozium, his 12-year-old son, with a deadpan look and monotone voice commands his father to, "Log the loss, and get a refill." The boy is cold and menacing, as he asks his father about seeing a boy cry, "should I report him?" Preston who hasn't refilled his dose and his emotions are beginning to kick in, almost faltering, "yes, of course you should.” We all know emotions are a powerful thing, and it is a measure of a man who can control his emotions. Preston's new partner, Brandt (Taye Diggs - "Go"), is a Cleric whose ambition is set for the top, and being at the top means deposing Preston. During a raid within Libria, Preston and Brandt come across another member of the Underground, a Mary O'Brien (Emily Watson - "Red Dragon"). Arrested for Sense Crime, they take Mary away. After having a wall torn away, Preston finds objects that come from a time before the war, a time when people could still feel, still have emotion. As emotions begin to take control, Preston is caught rearranging his desk, making it different from the others. He is almost caught by Brandt. While cleaning up on another raid, where Preston was almost caught letting some offenders go, he finds himself in a room filled with more artifacts. The room, like V's room from "V is for Vendetta," the room is filled with art, literature and music. Preston accidently starts up an old Victrola with Beethoven's “Ninth Symphony, First Movement.” Preston is wracked with emotion; memories of his wife, incinerated for Sense Crime come flooding back. The assumption here is that marriage and breeding are purely biological acts and have no emotional encumbrances. With music, art, and literature outlawed, the council has divested society of most of its attachments leaving only rote adherence to the Tetragrammaton Council. Here, the Tetragram is a quasi-religious symbol representing the theonym for the four letters that represent the name of God in Hebrew. 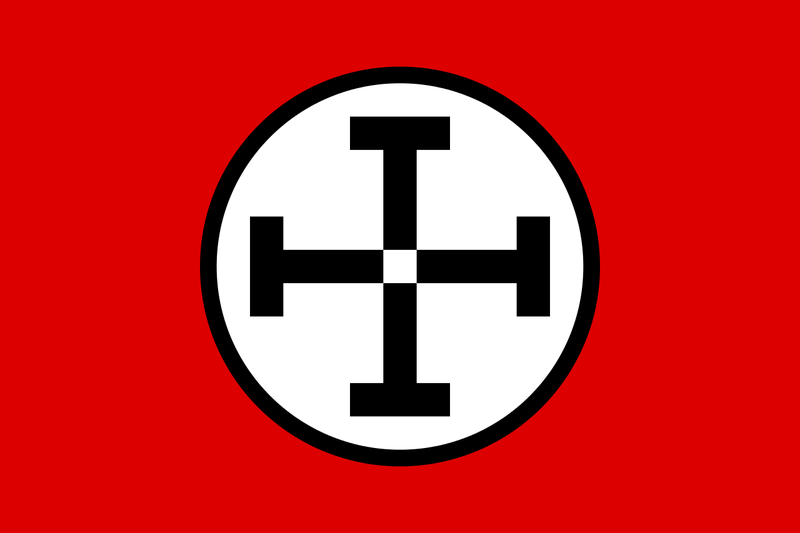 The T symbol is all present in Libria, representing the lower half of the cross, giving a subconscious under tone of religion throughout the film. The cleric is part priest and part warrior. Like the Shaolin priest who practices the martial art of Kung Fu (Wushu), the Clerics are masters in Gun Fu or better known in Libria as the Gun-Kata, A set of forms that optimize the number of victims during a gun battle. Preston is the master, but Brandt is close behind. Without Prozium, Preston questions his superiors, and while he finds their answers lacking, they find him losing faith in their cause. The battle between Brandt and Preston becomes one of cat and mouse as Preston attempts to contact the underground. Tricks within tricks, feints within feints, the viewer is left guessing if the resistance is real or not. Garth (William Fichtner - "The Perfect Storm"), a friend of Partridge, leads The Underground as they blow up Prozium plants within the city. The ending of the film is spectacular in the sense of the thought that Wimmer put into the script and Bale's effort in both the acting department as well as in the action scenes. Much of the ending is "Matrix" like but better in ways that make the film worth watching. The cast is primarily British, including Bale, and includes Americans Taye Diggs and William Fichtner who all do an excellent job in building their characters and the world around them. Vice Councilor Dupont (Angus Macfadyen – “Braveheart”) shares the title of antagonist with Brandt when it comes holding the people of Libria down in their controlled state. The film's composer, Klaus Badelt, brings a solid depth to the film, while Dion Beebe's cinematography depicts more of an alternative world rather than something futuristic or apocalyptic. Wimmer's choice to film in Berlin gives Libria a solid totalitarian look. Overall, "Equilibrium" succeeds where the "Matrix" fails in story, and it doesn’t encumber the viewer with political rhetoric like "1984."